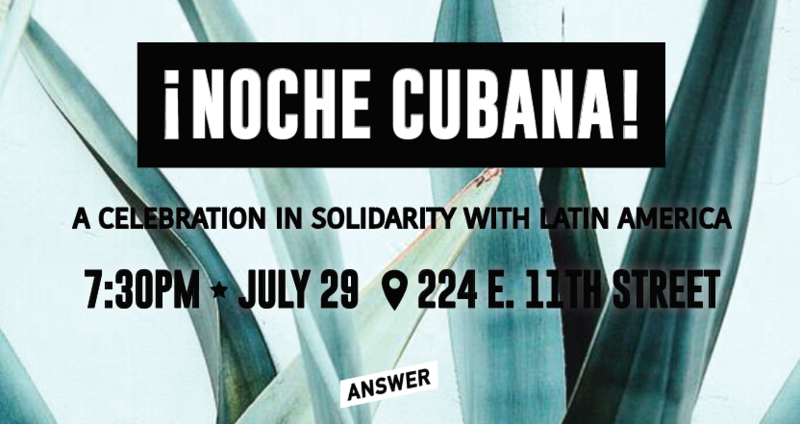 Join the ANSWER Coalition for our annual Noche Cubana, a celebration of the resistance of Latin America on July 29th at 224 E. 11th Street. Come and enjoy food, live music, dancing and an auction featuring exclusive items you won’t find anywhere else. Have a toast to the forward strides of the Cuban Revolution, the defense of the Bolivarian Revolution in Venezuela, and the struggle for democracy in Brazil all with your favorite anti-war organization. It’s bound to be an event you won’t want to miss!